IOGEAR MiniView III USB KVMP Switch Kit with Cables is a USB KVM and USB peripheral sharing dual-functional switch which allows 4 USB computers to share one USB console as well as two USB peripheral devices such as printers and scanners. The MiniView II switch features ability to switch USB peripheral devices from one computer to another asynchronously by using Hot Keys or On Screen Display, compliant with USB 1.1 specifications with 12 Mbps data transmission rate, USB keyboard and mouse emulation for error free booting, AutoScan Mode to monitor all computers, LED status display and supports resolutions up to 2048 x 1536. 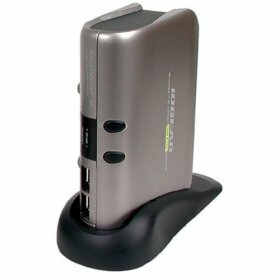 Mac Mod (link dead) reviews IOGEAR MiniView III USB KVMP swith and concludes with rating of 3 out of 5 that if you are tight on USB ports or want to share multiple USB devices between computers, this is a good choice. Otherwise go for a less expensive model. Good points include ads two USB ports without need of external hub and ability to name ports and auto-switching for easy monitoring. While the bad points are poor tech support, PC based manual, no USB 2.0 compliance and lacking buttons for switching USB hub and resetting hardware.